The first time I tasted Tom Yum Spaghetti was when in Bangkok sitting inside a restaurant chain called Kin Kao Kin Pla, which is what my Thai Hubby calls a “hiso” restaurant (hiso means high society, but we consider hiso restaurants in Bangkok anywhere that isn’t a street vendor and in an air-conditioned building). The sauce was so creamy from the coconut milk, yet it reminded me of an Italian pasta sauce with the chunks of tomato, but also it had the perfect spicy, sour taste of tom yum soup, and the huge prawns were cooked perfectly. We ate Thai-style and shared many other dishes that meal, but my favorite one was the Tom Yum Spaghetti. 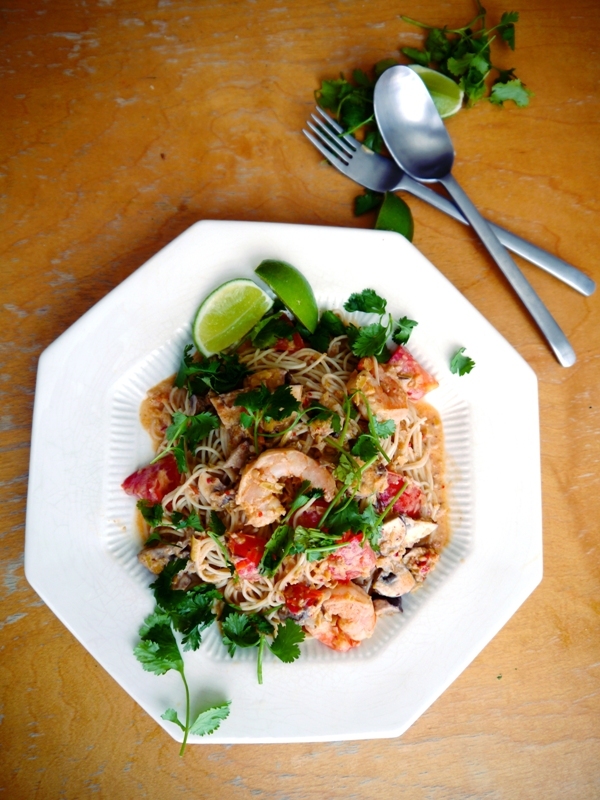 My Tom Yum Spaghetti recipe is a combo of what I ate at the restaurant along with some of my own additions. It has been one of my Thai Hubby’s favorite recipes ever since I posted this recipe years ago. 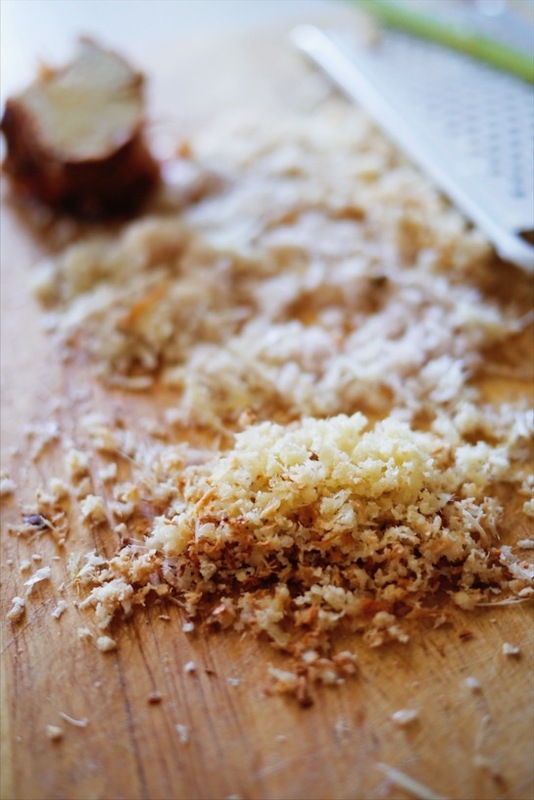 But even though I loved the flavor of the sauce, I could never break down the lemongrass and galangal enough in my food processor, so the woody texture was too much for me. My Thai Hubby didn’t mind since Thais sometimes even take lemongrass pieces out of Tom Yum and gnaw on it, but I just couldn’t get over it. Finally I did some research on it, and figured out an awesome way to get lemongrass to the fine texture I was looking for. Take off the outer peels, which are the layers that come off super easily. Once you get to layers that don’t easily come off, stop peeling the layers. Cut off the stem on the lemongrass’ fat end. Rub that end on a zester. 4. As you rub it, it will get frayed, so cut off the frayed parts, and just start the process again until you reach the thinner ends that you can’t really break down. Then do the same process with the galangal, but you don’t even have to peel anything. Just rub either end of it on the zester. 5. 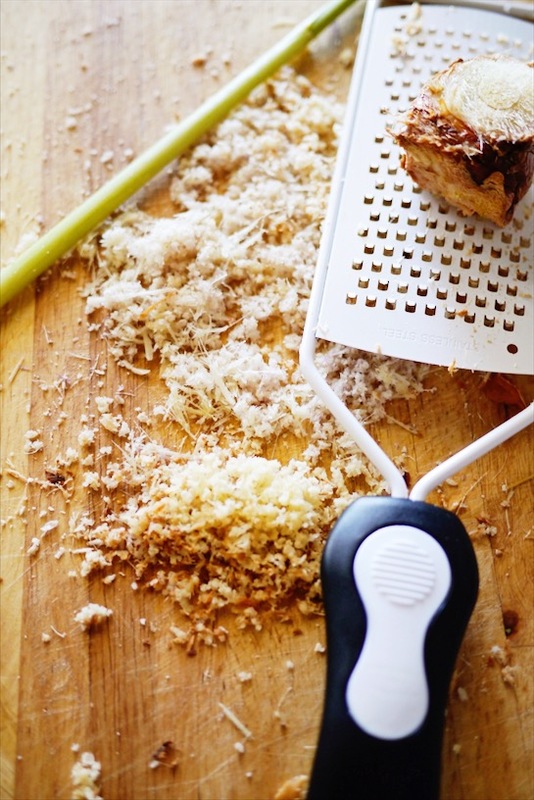 You are left with a super fine shavings of packed lemongrass flavor with zero woody texture! Yay! I’ve made this for my Thai family, and they adore it, and I’ve made it for my American friends who have never tasted Thai food, an they are obsessed with it, which means its the perfect Thai-American fusion!! So you have to try it! If you make it, I want to see! Take a pic and tag us on Instagram @thaifoodie! Tom Yum Spaghetti is a Thai fusion dish packed with lemongrass and galangal, creamy coconut milk, spicy dried Thai chilies, zesty tamarind and lime flavors that my Thai hubby and my American friends adore! Best week night dinner right here! Chop the stem off the fat end off the lemongrass stalk. As you rub it, it will get frayed, so cut off the frayed parts, and just start the process again until you reach the thinner ends that you can't really break down. Do the same with the galangal. 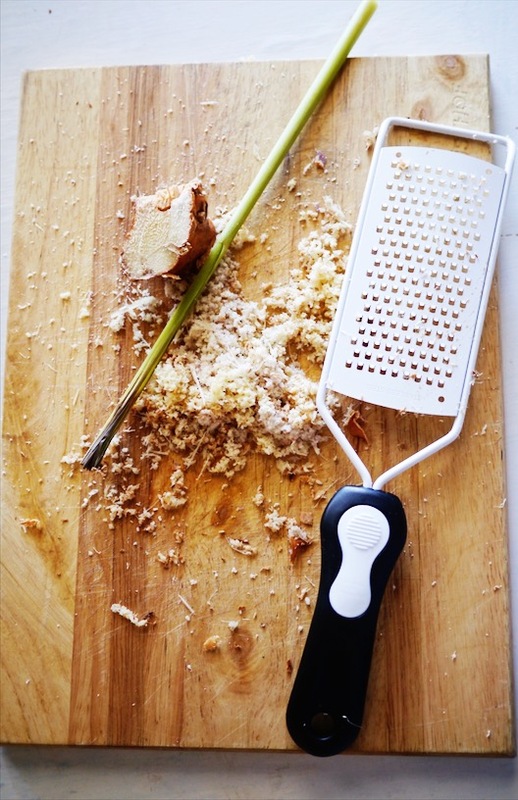 Place lemongrass, galangal, garlic, 2 kaffir lime leaves, and dried chilies in food processor. Pulse until fine. Boil the water for the pasta, so you can cook the noodles while you are making the sauce. Add 2 tbsp. of cooking oil to a wok or large saucepan and warm over medium-high heat. Once pan is warm, add in the puree from the food processor. Cook until fragrant, 1-2 minutes. Add in coconut milk and Thai chili paste. Stir until combined. If cooking with chicken, add it in now and cook until done. 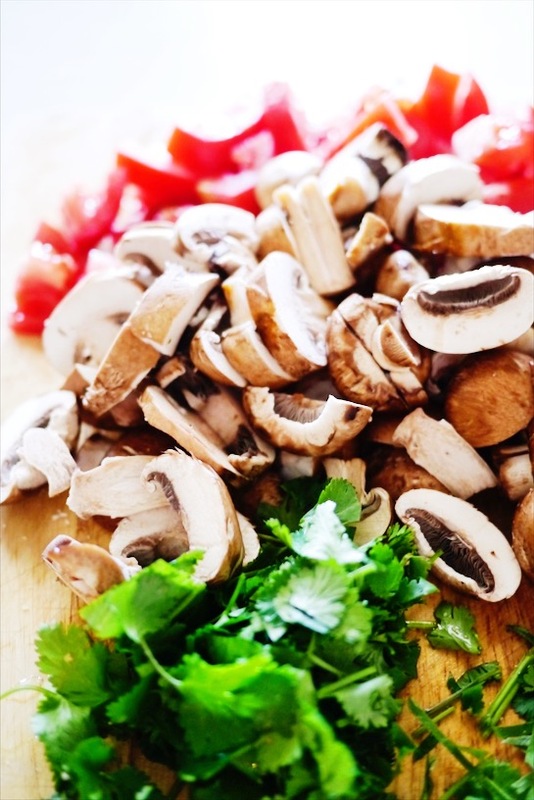 Add in mushrooms and cook until they are tender. Add tomatoes, and if using shrimp, add in now too. Be careful with the shrimp since it cooks so quickly. It might just take 1-2 minutes for it to cook, once it's turned pink and white and pretty, then turn off the heat. Add fish sauce, tamarind and lime juice to taste. I like mine more on the sour end. The coconut milk is already going to make it sweet, but if you like it sweeter, you can also add sugar to taste. Place noodles on plate, and put the sauce on top. Sprinkle some cilantro and kaffir lime leaf strips on top and enjoy! If you don't have a zester, you can just try to mince the lemongrass and galangal as much as possible, and then put them in the food processor, but with my food processor they don't break down as fine as I want. 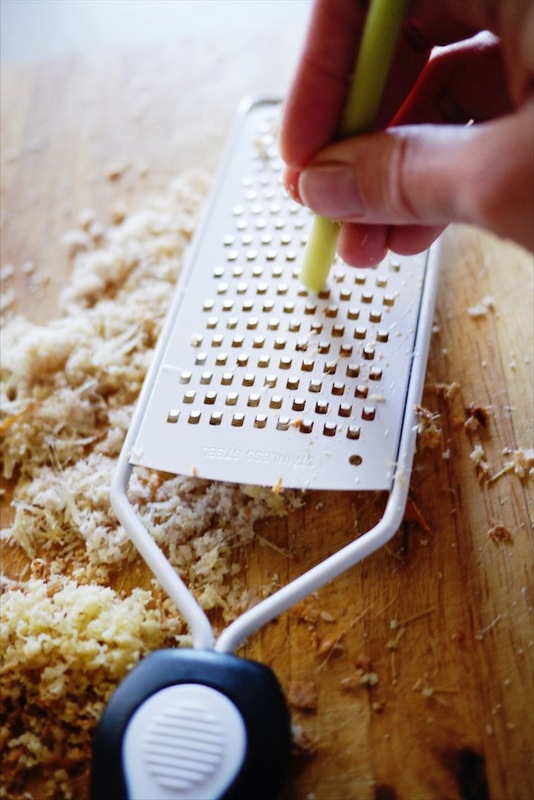 But use the food processor if you don't mind the more woody texture. Fresh kaffir lime leaves are hard to find, and I've made this dish without them, and it still tastes great! So just leave them out if you can't find them. My husband and I recently got back from vacation in Thailand, and had read before going that this dish was a “thing” in Thailand and surprisingly good. We didn’t see it on any menus while we were there, but I just made your recipe tonight and fell in love! Even our young kids loved it, which is always a bonus. Thank you so much, definitely filing this away as a keeper in our house. Yay! Im so glad you and your whole family enjoyed it Karissa! <3 Thanks so much for sharing! Very nice post which tells each and everything step by step. 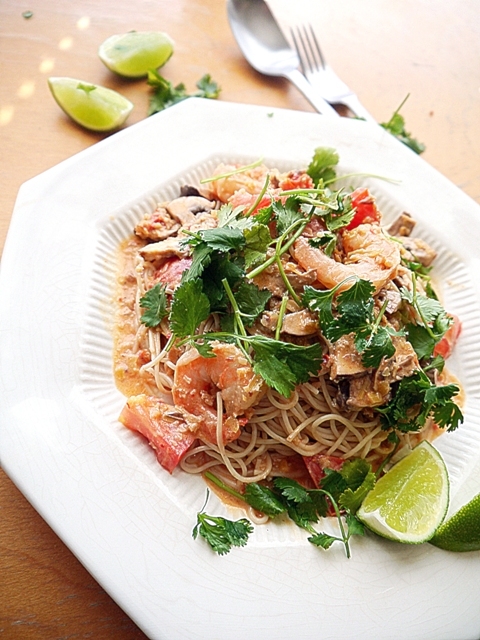 by following the guide of this post anyone can make Tom Yum Spaghetti by their own in the house. thanks for sharing such a nice recipe. We also provide a variety of Spaghetti dishes in our restaurant. This is my comfort food. Reminds me so much so my dad since he used to cook this every time to us. So whenever I have a long vacation or I need to travel for work. I usually miss eating this food that sometimes I ended up making it by myself. Aww, that’s awesome! I love that it brings back sweet memories for you!